The Jazz Connection Big Band opening the 1st Annual Steel City Jazz Festival. Photo courtesy St. Jacques Photography. 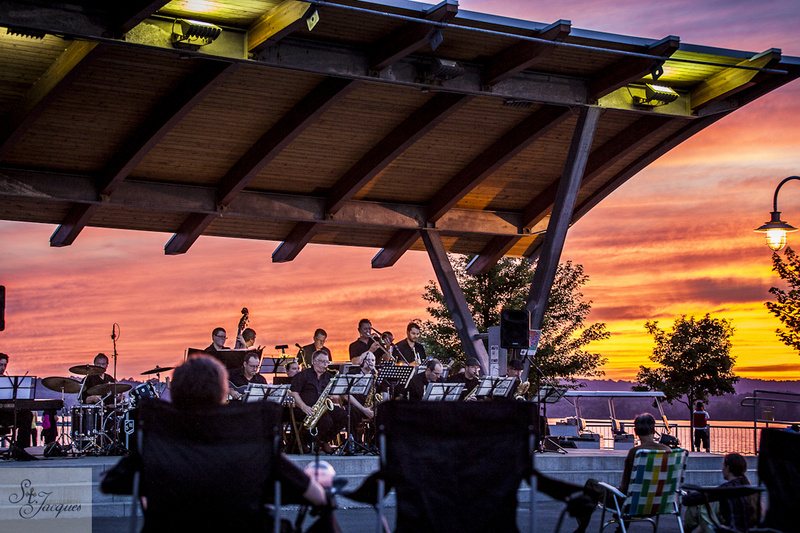 If you were at last year’s festival opener down by the Hamilton waterfront, you might remember two things: the beautiful sunset, and the killer band (not necessarily in that order). The Jazz Connection Big Band play powerful, energetic jazz, and I’m very happy to say they’re back at the Pearl Company on October 24th for this year’s Steel City Jazz Festival. Plus, they’re bringing along vocalist Carissa Kimbell (another former SCJF performer) to kick the evening up an extra notch. Tell me how the band got together. Simon: When I finished teacher’s college I knew that just playing in the local concert band was not going to be enough for me. I wanted to start a rehearsal band. I knew there were a lot of guys in and around Hamilton that would be interested in being in a big band that played good jazz charts, you know stuff that players like to play, but they didn’t have any charts. I met Frank Musico while playing in the Hamilton Italio-Canadian band. He said, “I have charts but I don’t know enough people…” and The Jazz Connection Big Band was born. Steve: For the last five years Jazz Connection has morphed into a performance unit that rehearses only for specific gigs which has demanded a lot of personnel changes – progressing from casual amateurs to our current roster of pro and serious semi pro musicians. Today the band is managed by a committee – Simon and I run all business, booking, marketing and personnel. Paul Taylor runs all issues of musicality, programs etc as our Musical Director. Frank is still actively involved and contributes his talents where needed. We started including “A” list performers a few years ago including John Sherwood, Paul Hoffert, Adrean Farrugia, Sophia Perlman, Mike Malone, Christian Overton and many others. The band sort of runs like a commune where all key members are encouraged to contribute ideas, opinions etc. I know you guys have worked hard at cultivating a unique and recognizable sound for the band. Tell me a bit about the process, how you choose what feels ‘right’, what you look for in charts or which arrangers/composers are some of your favourites. Steve: Great question but also hard to answer cause it’s more of an organic process based on the personnel and our personal tastes. We all agreed quite some time ago that we were not going to play the same tired old big band stuff that every other band plays, nor were we going to play like most Canadian bands – “all brain, no balls”. A number of Toronto musicians have described our sound as very American – gutsy, passionate, aggressive, in your face and kinda “knuckle dragging” as opposed to the more cerebral approach that many bands take. We take that as a great compliment! Our charts come from a variety of people that submit them for consideration and we run ’em down. If a chart clearly doesn’t work for us on first run through it’s dismissed. If it seems to have potential we run it again to make sure it “fits”. Quite often we take good charts and “Connectionize” them by altering the rhythmic feel, adding sections, deleting sections, changing the tempo marking etc etc – thus making them distinctly Jazz Connection charts. One of the most common comments we get is the breadth and variety of styles we play – swing, funk, rock, latin etc. We have no favorite composers/arrangers but have tended to lean towards the work of Buddy Rich, Jim Martin, Gord Goodwin, Bob Florence, Clayton/Hamilton and other innovative modern big bands. Simon: I think our sound comes from our people just as much as from the charts we select. Basically we play what we like. If chart resonates with the band we find a way to make it fit our sound. Our Musical Director Paul Taylor does a great job of harnessing the band’s energy and talent towards producing that high energy/aggressive style we like to play. You’re playing with Carissa Kimbell, who was also featured at your Beaches Jazz Fest performance. Tell me a bit about Carissa, how your last performance went, and why she’s a good fit for the band. Steve: Carissa originally contacted me over a year ago asking to be put on our “sub“ list. For the Beaches Jazz Fest I had already booked Sophia Perlman but she had a tour that got extended and was unable to make the Festival. Sophia recommended Carissa, not knowing that I’d already had communication with her. Sophia’s endorsement really pushed us to give Carissa a shot and she really Shot it out of the park. She brings the same passionate, high energy to the vocals that the band puts into the instrumental material. Simon: I first heard Carissa at last year’s Steel City Jazz Festival, I was blown away by the maturity and tone of her voice. I knew she’d sound great with our band, so when Sophia had sub out of the Beaches Festival it was a no brainer on who to ask. We had one rehearsal with Carissa before the Beaches show – she sounded as if she’d sang with us for years. I’m not sure exactly what it is that makes Carissa a great fit for the JCBB, but if you come out to the show on the 24th you will hear it. Simon, you were one of the first people to reach out to me and help the festival get started, and you’ve both been very supportive of the festival over the past two years. What got you interested in the festival? Why do you think it’s a good idea to have a jazz festival in Hamilton? Simon: One of the original concepts for my rehearsal band was that it was to be Hamilton based. All of the players I had in mind for the original lineup had a Hamilton connection. Even now, a lot of the guys in our line up have some kind of connection to Hamilton. So, when I saw online that you wanted to start a Jazz Festival here I knew we should be part of it. Besides, so many good Jazz musicians live in, came from or learned in Hamilton and that should be celebrated. How it fell to a kid from Oakville to get it going I’m not sure…. Steve: For me Hamilton (and region) is a largely ignored, underrated virgin territory for jazz. Toronto claims much of the glory but I’d stack some of our talent up against TO guys any day. It also seemed to me that if small towns like Barrie, Picton, Oakville, Brantford could mount jazz festivals with varying degrees of success then why not a city the size of Hamilton? I’d like to believe that despite the stereotype image of Hamilton as a “classic rock/country music” city that there are enough people of different tastes to make this a viable event – I think the results have proven me correct. The Jazz Connection Big Band play with Carissa Kimbell at the Pearl Company on October 24th. Show starts at 8pm, tickets are $20 and can be purchased online here. Next Next post: Quarter to Nine and the Messore-Palka Quintet: Our last show of the year!